Traffic updates now avail on Sirius Canada? - Page 2 - Audi Forum - Audi Forums for the A4, S4, TT, A3, A6 and more! Traffic updates now avail on Sirius Canada? Re: Traffic updates now avail on Sirius Canada? It seems accurate, i.e.. when it shows a traffic blockage it is exactly where it appears on the map. But it also seems limited to a small section of the 401 and the QEW/Gardiner. raj999 that is interesting that you are getting it with no subscription or trial at all. My traffic data seems to be gone now. No more TMC for the last few days. I called Sirius Canada to ask if they were offering the traffic as a service yet, and was told it was something only the dealers could activate. Huh?? I asked if there was some kind of trial, and was told no. Although he didn't sound like he had the first clue about what he was talking about. Oh well, no more traffic for now. Will try and activate both radio and traffic with Sirius/XM when my trial is up. I've been in dealer demo mode since getting the car in April. Radio stopped working in Aug, and made a mental note to call and activate the 3 month trial. Driving from Moncton, NB to Toronto, started working again with traffic on Sept 3. On Sept 13th, I lost radio and traffic again, and it hasn't come back. I noticed it accurately predicted construction, but also regular slow downs in flow as well, at least on the Gardiner. Will call to activate the 3 month trial sometime this week and see if traffic comes back. Anyone else have/not have traffic? I think that is about the same time I lost my traffic. I want it back! So annoying that Sirius Canada can't provide it and knows nothing about it. My traffic came back today. Got a message that my Sirius subscription was being updated which lasted a few minutes, and when I checked my Nav, TMC was listed once again. I am still my original demo until the end of November and still haven't purchased any service from Sirius Canada or US. Anyone else seeing traffic service again? I saw the TMC with a stroke through it today. I haven't subscribed since my demo ended, but it seems to corroborate your experience. I received a mailer a few weeks ago offering a year sub for $75, but it ended before I got the mailer. I'm going to try calling to see if I can still get the offer, and then see if the clueless agents know anything about a traffic sub. Will update with results. I want to call Sirius and ask, but I really do not look forward to speaking to their phone agents. Traffic is working great again. Don't even have a sub. Most channels are working for me again so I'm assuming there's a free preview going on again. 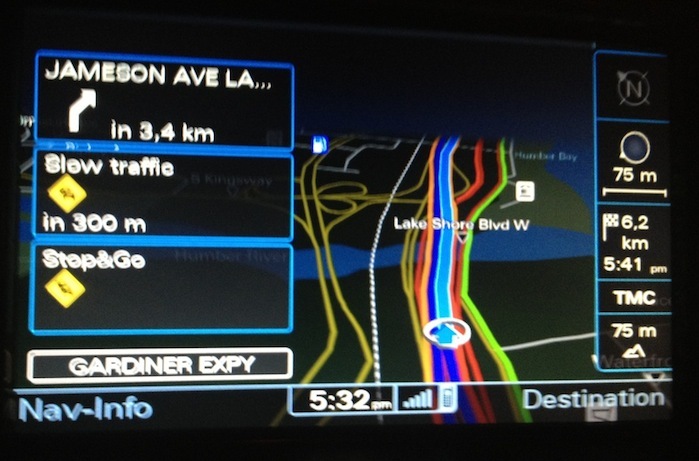 Quick Reply: Traffic updates now avail on Sirius Canada?